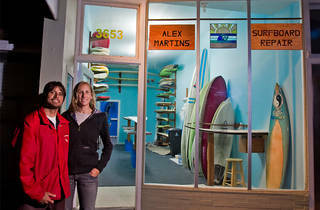 Husband and wife team Alex and Sarah Martins, a former professional surfer and a former surf instructor, are at the helm of this narrow, blue-hued repair shop. Together, they meticulously color-match and repair fiberglass, epoxy and wood surfboards with environmentally conscious materials like VOC-free resin and repurposed supplies. Alex is a master of his craft, specializing in ding repair and though they accept a limited number of boards each week, all of their work is guaranteed with a wait time of typically only two to three weeks.